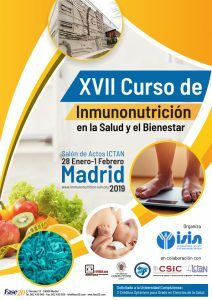 THE INTERNATIONAL SOCIETY FOR IMMUNONUTRITION (ISIN) together with the COMPLUTENSE UNIVERSITY OF MADRID (UCM), the SPANISH SOCIETY OF PROBIOTICS AND PREBIOTICS (SEPYP) and the ROYAL NATIONAL ACADEMY OF PHARMACY (RANF) have been programmed to carry out an Immunonutrition course in their headquarters INSTITUTE OF FOOD SCIENCE, TECHNOLOGY AND NUTRITION (ICTAN). C / JOSÉ ANTONIO NOVAIS, 10. MADRID-28040 from January 28 to February 1, 2019. High level experts on Immunonutrition will be the speakers coming from diverse Spanish and foreign Research Centers and Universities. The whole time of the course is 32 hours and 2 academic credits will be summoned. 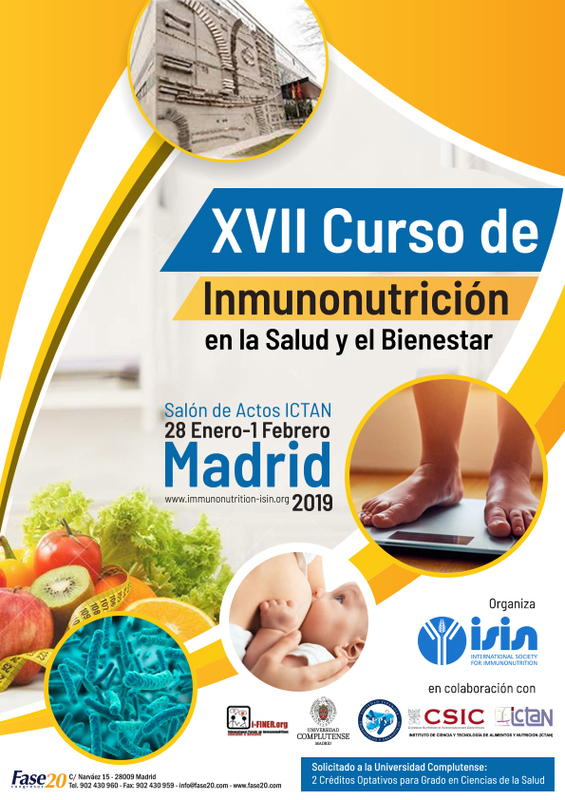 If you are interested in the relationship between Nutrition and Immunity, in all its multidisciplinary field, do not hesitate to consult the complete program that appears in the attached link and contact the technical secretary to reserve your place for only 125 euros, and take into account that the capacity is limited.